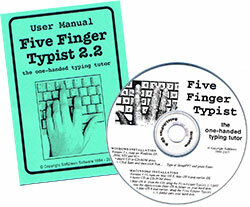 Explore Five Finger Typist before buying. The demo program allows you to judge whether one-handed typing will benefit the user. With the demo you can inspect all features, work through the first four lessons and browse the remainder. to download a copy, click on the type of computer you have: Windows or Macintosh. we can e-mail, or post, you a copy: e-mail us your contact details. You can also download the User Manual and read about all the features of the program.